"penawar hati adalah muhasabah, bukannya ubat batuk...."
Gerard Butler can act, but can't teach English. The very first class of this semester gave a very frightening impression for me. I won't get above C in my English class. Why? Because my lecturer looks similar to Gerard Butler in 300. Yeah, except he did not the sword. With his beard and sharp eyes, he gazed around the class while talking, making the class more silent than ever. He insists of endeavoring hard for the class, but how can I achieve it in a class lead by Spartan? Unless I go to war against Persian, I will never win the war against ENG 101. What a mess. cikgu ko: madness?? 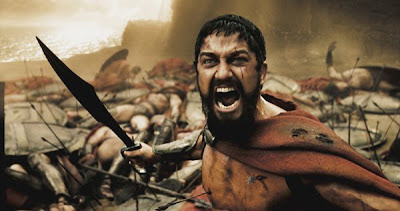 this is SPARTA!! actually aku pon terpkir lecturer aku tu wat scene tu. dh ar muke sebijik. ak baru je tgk law abiding citizen. butler mmg ganas r, cmne bole ajar org bi?